A planner named Brad Barnett has created a pretty amazing interactive map of U.S. streets named after Martin Luther King, Jr. The map displays a range of demographic information from the cities that are home to these MLK streets, using data from the 2016 American Community Survey. This mapping project is hardly alone in pointing out the irony of these MLK streets running through communities that are both historically Black and in possession of lower economic/educational-attainment levels. There have been many news articles and studies over the years on the subject. But the visual impact and interactivity of this is unique, making this subject matter well worth revisiting — particularly in Dr. King’s home town. First, we’ll compare two maps on population and racial divisions. In the “Percent White” image, the census blocks with a majority of White residents lie to the northeast of the street, clearly disconnected from it. A look at the “Percent Black” one clearly shows that the street runs through neighborhoods where the population is majority Black. The geographic segregation of the city by race is likely well known, but seeing that divide in terms of how it lies upon the street named after Dr. King is particularly thought provoking. What would he think about this segregation if he were alive today? These next two maps show where the highest percentage of residents with college degrees live, and where the median home values are the highest. In both cases, the benefits fall upon the majority-White parts of the city — ones that are fairly disconnected from MLK Drive. With the level of education, and with the personal wealth that stems from high home values, privilege seems to be largely eluding the majority-Black neighborhoods that surround the street. The fact that it was named for a man who spoke about equal education and economic justice is noteworthy. Are we taking Dr. King’s message of equality and justice to heart in his home town? Looking at the street we’ve named for him, one has to wonder. Probably the most significant thing that’s happened to MLK Drive in a decade (or more) is the re-routing of it. The street was reconfigured dramatically in Downtown a few years ago in order to make room for the Mercedes-Benz stadium — a project that also saw the relocation of two historic Black churches for the sake of professional sports. Atlanta seems to devote a lot of energy and money towards mega-projects like that one in order to score bragging rights. In this case, the bragging seemed to have a lot to do with the Super Bowl that’s coming up in a few days in Atlanta (one of the arguments for the construction of the Benz stadium was that it was needed for attracting the Super Bowl). Do we spend an equal amount of energy on residents and neighborhoods? Considering that we continually rank at rock bottom in the U.S. with economic mobility for residents, with race and class figuring heavily into that status, it’s question worth continually asking. Big talk about beautification of the street, but what about the neighborhoods? Former mayor Kasim Reed spoke about MLK Drive needing a revamp with new sidewalks, signs, public art, paving, and more. And it’s definitely important for the street to get redesigned for safety, so putting some effort into redesign is a good thing. In fact, MLK ranks as one of the most dangerous roads for pedestrians in Atlanta, according to data from GDOT. 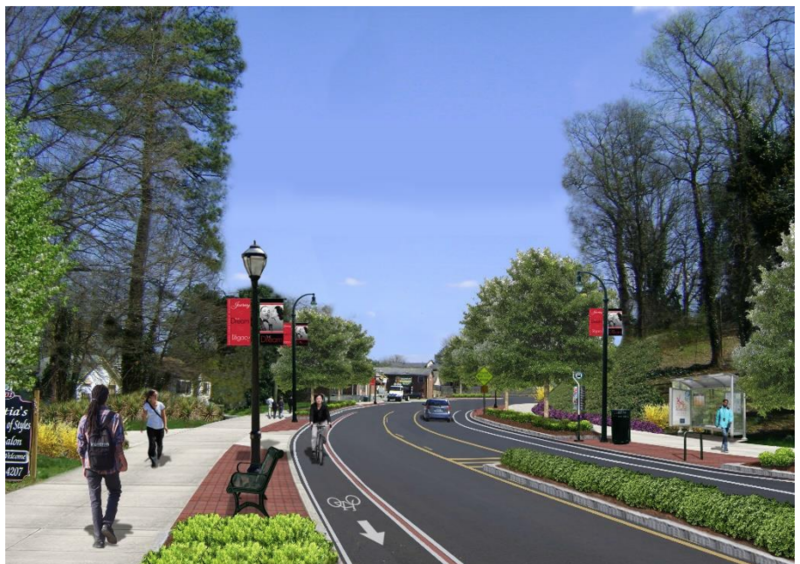 The Renew Atlanta website shows what will happen to 0.26 miles on MLK Drive, from Barfield Ave to Florida Ave, pictured above. These are nice amenities, but the fact that they last for only one quarter of a mile makes both their impact and their intent questionable. Does this help improve the overall urbanism of the adjacent neighborhoods and the residents and business owners in them? Or is this a superficial effort towards beautification that will improve aesthetic appeal primarily for people passing through? 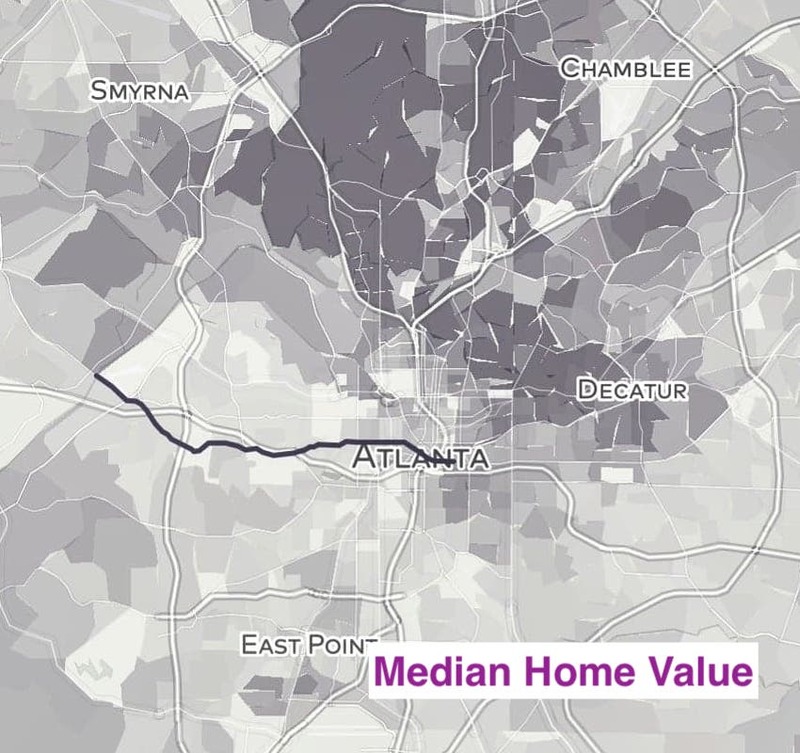 MLK Drive passes alongside at least 15 distinct neighborhoods in the City of Atlanta, including Vine City, Hunter Hills, Mozley Park, and Ashview Heights. Turning our focus towards incremental improvements for the people and places in those communities is just as important as any mega-project. New stadiums, corporate relocations, office expansions — these tend to be the ways we measure success in the city. We’ve been using that measurement for decades, and it’s gotten us nowhere in terms of equity, as is evidenced by the maps above. In the city of Dr. King, we can do better.